Oneness Marriage...The Way God Intended! 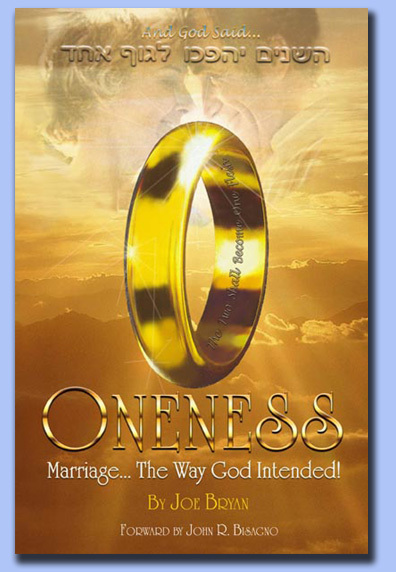 A Book by Joe H. Bryan that explores the concept of ONENESS presented in the Bible in reference to the marriage bond. I am not sure to whom we should credit such wise counsel as this, but I do know that when it comes to marriages in today's society, this old adage could be best applied. If courting couples had to take a test on the principles of marriage before they could get a marriage license, I am not sure many of them would pass. There is however a guidebook that lays out the principles for a great and lasting marriage and it's available in most every home in America. The guidebook? The Bible. God's Word has always contained the secrets to a successful marriage. Unfortunately not every married couple in America has searched the Word for the "instructions" that God has so skillfully engineered. The one step in the instructions so many couples have overlooked is, Joe Bryan believes, the reason so many marriages fail today. With the divorce rate now over 50%, it is time to reverse the trend and start applying this simple step... Oneness! Is it possible to divorce yourself? No! If you and your spouse are truly as God intended, ONE, then divorce would not be possible. Think about the way you treat your spouse. Would you want to be treated that way? So many couples forget about the second promise they make in their wedding vow. The first is to "love", the second is to "cherish".